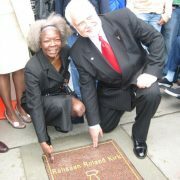 Dorthaan Kirk and the mayor of East Orange, NJ, at the unveiling of "Rahsaan's star" on the East Orange Walk of Fame. Photo by Johanna Fee. Dorthaan Kirk is a jazz luminary in her own right. In addition to her work as Special Events and Programs Coordinator at WBGO, Jazz 88 FM, where she has been since the station’s beginnings thirty years ago, she also serves on a myriad of committees, produces the Jazz Vespers series at Bethany Baptist Church in Newark, and has been the recipient of numerous awards for her community-based initiatives in the arts. On top of it all, she is the keeper of the flame of Rahsaan’s legacy. I first met Dorthaan several years ago during the course of research for a book I’m writing about Rahsaan. Dorthaan and I got together again for a 75th birthday tribute to Rahsaan in Austin, Texas, at the Elephant Room–an event that I organized with her help. A local group, the Austin Jazz Workshop, performed Rahsaan’s music and were joined by special guests Steve Turre (trombonist and conch shells), Hannibal Lokumbe (trumpet player and composer), and poet Betty Neals who collaborated with Rahsaan on his song, “Theme for the Eulipions.” Also, Dorthaan generously provided gift bags that were filled with keepsakes and information about Rahsaan. MC: So here we are, a few days after August 7th, on what would have been Rahsaan’s 75th birthday. You once told me that you felt that God didn’t have plans for Rahsaan to be an old man, but can you imagine him at 75? DK: No. Some of us, it takes a long time to do what we were put on earth to do. He did his in a short time. He was an old soul anyhow. He was contemporary but he had an old spirit about him when it came to life and certain things. He did what he was supposed to do and left. But he’s around-this tribute speaks to that. Because we’d talked about having this tribute for a few years, and now that it’s happened, it’s clear that it took on a life of its own. 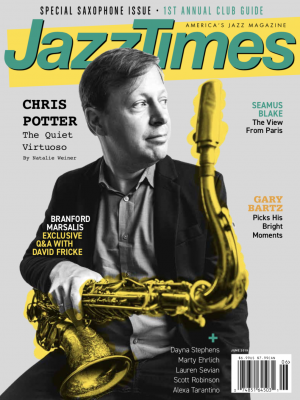 It was only the universe that fixed it so that Steve Turre could be there. Steve is a busy musician who gets a lot of work, and I couldn’t have planned it any better than to already have him performing in Houston on the 8th [with the Latin Jazz All-Stars] and to our event on the 6th. And of course there’s Hannibal, who’s already right there [currently residing in Bastrop, TX], but he could have been in Europe performing. Also, it’s really great that other friends were able to attend, like Betty Neals who recorded with him, and Les Scher, who lives in northern California and who first met Rahsaan back in the sixties when he was just a college kid. MC: And you were able to come, too. DK: Oh well, when it comes to Rahsaan, I just drop everything; everything else takes a back seat. See my life is busy; sometimes stupid busy, but I just change my priorities. MC: What did you think about the tribute? You’re originally from Texas [Houston], could you ever have imagined something like this happening here? DK: That’s why I was so excited! When you live in the East and you have all of these clubs and the major part of the musicians do live in this area, I guess you sometimes take on a snooty attitude-for lack of a better term-about the rest of the world. Except for Europe-we know it’s big on jazz-but with the demise of a lot of clubs across the country, you kind of think that nobody has it going on. I guess the moral of the story is this: in every corner of the U.S. somewhere, somebody’s doing something to keep jazz alive. And I thought it turned out great! It was a reunion of folks, like Steve and Hannibal reuniting, having had a long history, which I didn’t know about, and the band was just fabulous. I had no idea, even though I had heard the CD, that the band was that good. Too bad they aren’t nationally known. So it was a great event, even right down to this guy, Tom, who brought me photographs of Rahsaan from the seventies that his sister had taken in a club in Montreal. So Austin, Texas, came through big-time. Who would’ve thought? Which proves that New York is not the center of the universe like we tend to think sometimes. At least we admit it (laughs). And the audience loved Steve playing the shells. I’m sure they haven’t seen anything like that. MC: I saw Steve at the Knitting Factory about ten years ago with the shells, but I was amazed to see him the other night performing without the use of a microphone. DK: Well, he’s definitely perfected that and nobody’s copying it either, so it’s kind of unique to him. I think a lot of those people didn’t realize that he is in the Saturday Night Live Band, and that’s why I gave a little history about him. Also, I had hoped that Hannibal would sit in the with band, but what he did do instead was play a gospel song, which was very, very, very moving. MC: Were you surprised at the turn out? I mean at one point, there was a long line down the street, wrapped around the corner. DK: Well, the truth be told, once I connected with Nicki [Nicki Cutean, publicist for the event] and of course, you, I just felt that it was going to be really great. People are really in tune there, so once I got there, I was pretty confident that it was going to be pretty well-attended, and then you had told me that the local paper had listed it as their pick for the evening. But what stunned me was when I got up to speak, they all gave me a standing ovation, and I thought, ‘Oh my God, am I going to be able to speak?’ That pretty much stunned me-I mean, I’m Rahsaan’s widow but they don’t know me. I think that was out of respect for him and his music, and perhaps because I’m doing whatever I can to keep his name out there. MC: What would you like to see come out of an event like this? More events in the future? DK: Well, yeah, more events in other places. But more than anything, just to keep Rahsaan’s name out there in the public’s ear and eye and in particularly with young people. A few young people have discovered him and found me like the young man, Alex, who goes to school in Florida, and the young man who went to Boston College and wrote his thesis on the Jazz and People’s Movement. And of course there’s Derek Trucks, who has recorded Rahsaan’s music. Thank you, Derek! Just recently, Derek’s recording of “Volunteered Slavery” was used on the T.V. show, House. One of the reasons that I wanted to do the gift bags and the discographies was so that people who attended would have something to physically hang on to, and maybe some of the people that had never heard of him will go on the internet and find out more about him. I know there’s a lot of stuff, even though I don’t have the time to go and check it all out. MC: Could you elaborate a little further about the “Radio-Free Rahsaan” CDs that were included in the gift bag? DK: Yes, many thanks to my long-term friend, Steve Robinson, who did that radio program with Rahsaan in Boston, back in the seventies. “Radio-Free Rahsaan” was aired in the early eighties on public radio stations. Unfortunately, Rahsaan himself never got to hear it on the radio, but again, it’s still out there and maybe one day Steve will offer it to public radio stations. [“Radio-Free Rahsaan” was a radio segment that featured Rahsaan as DJ; posthumously Dorthaan and Robinson added a half-hour segment to the series-an audio documentary about his life]. Steve is also responsible for my career at WBGO, because he was the one that pretty much told the founder, Bob Ottenhoff, that they should hire me. Bob was either dumb enough or smart enough to hire me, however you want to look at it (laughs). MC: I remember you once telling me that Rahsaan was really big on birthdays, Christmas, etc. DK: Yeah! He was real big on any kind of holiday because that was the one time we had an opportunity to be normal, if you will, and invite over friends and family. He loved that. DK: Yeah, he really, really was, and that’s why we could still be having that tribute, and that’s why I chose the people I chose to speak there, because each one had a completely different perspective-like George Wein, for instance, as a festival producer, and of course we can’t leave out Joel Dorn, his record producer. He was very close to Rahsaan personally, but it wasn’t until the last few years of his life that he allowed Joel to really be a producer in the true sense of the word, because he was always his own person, if you will, and had his own ideas about music. But as we all know, you’ve gotta have a producer because that’s the way the business works. And I miss Joel because I don’t have anybody to ask, “Should I do this, what do you think about that”-I’m on my own now that they are both gone, but I’m doing okay. They taught me well.